Unlikely words from a recent hurricane survivor watching her ruined living room furniture swirl down the street. Yet there it was. And the same sentiment was echoed by many others who had lost nearly all their possessions to violent winds and horrendous floods. What? How could they possibly be so upbeat in the face of disaster? Could it be that, against all odds, in the sneering face of a Noah-esque flood that literally threatened life, limb, and livelihood, they found – to their utter surprise – that gratitude floats? My speaker/writer friend Gari Meacham shared this and other amazing insights she encountered in the aftermath of Hurricane Harvey’s recent massive destruction of Houston. Stories of heroism and courage, of people who refused to be beaten down by their circumstances. My fave was about the woman trapped in the attic of her home with her elderly mother and two young children as the water rose and rose. They finally managed to bust through the decades-sealed attic window to wave pillow cases and yell for help, but try as they might, they couldn’t grab anyone’s attention. The glimpse of a rescue truck two streets over infused them with hope that someone would hear them and come to help. But no one did. They kept yelling. The water kept rising. So did fear and discouragement. The woman anxiously looked around for something that would make enough noise to attract attention from that distance. Nothing. It was, after all, an attic, generally devoid of useful items. So the woman prayed. In desperation, she asked God to send her a foghorn. Suddenly she remembered her older brother teasing her about sounding like a foghorn back when she was a teen taking opera lessons. She hurried to the window, leaned out as far as she could, filled her diaphragm with air as she’d been taught so long ago, and began singing an Italian aria, the likes of which she had no idea she could still belt out at such a grand decibel. Her astounded family could only stand and gawk. They had no idea she had it in her either. Yep, it often surprises us, but when we lose so much, we often find that gratitude floats. Our vision begins to focus on the miracle of what we have left rather than all we have lost. The world thinks we should feel defeated, but we don’t. Because we have hope, maybe more than ever. We feel revived. Refreshed. Rejuvenated. 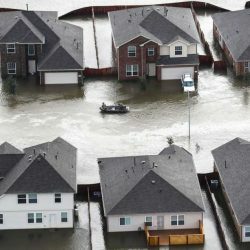 Although we in the Tampa Bay area were fortunate not to experience the extensive flooding that Houston had, many of us had power outages and property damage from falling trees and debris when Hurricane Irma hit shortly after Harvey’s exit. I found myself, along with my family, exhaling a relieved collective breath that it wasn’t worse. We can replace things. We cannot replace loved ones. So today I’m focusing my prayers on gratitude for all that we have, not what we don’t. How about you? What, my BBFF (Blessed Blog Friend Forever), is your prayer focus for today? 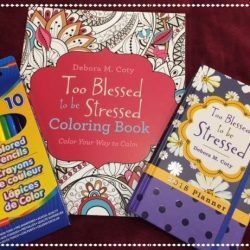 Oh, and don’t forget to enter my Color Your Way to Autumn Calm Giveaway to win some great prizes! Just click on “Freebies” right here at my website, then look for the contest. The random drawing will be on October 22! Deb, while this in no way compares to your friend who watched her furniture float down the street or the family trapped in the attic of their home during a recent hurricane, my observation has really impacted my husband and me. Our two freezers are now completely bare (except for ice) after losing power for 5 days during Hurricane Irma. We have serendipitously found we don’t need that much food! I’ve been buying less the last 3 weeks since Irma, and we are doing just fine. In fact, we are blessed beyond our needs.